Even though it's technically autumn, New York City seems to still want to hang onto summer just a little bit longer. The warmer temperatures we are experiencing don't want to make way for the chilly autumn breeze. Oh, how I long to sport my boots and cozy sweaters. 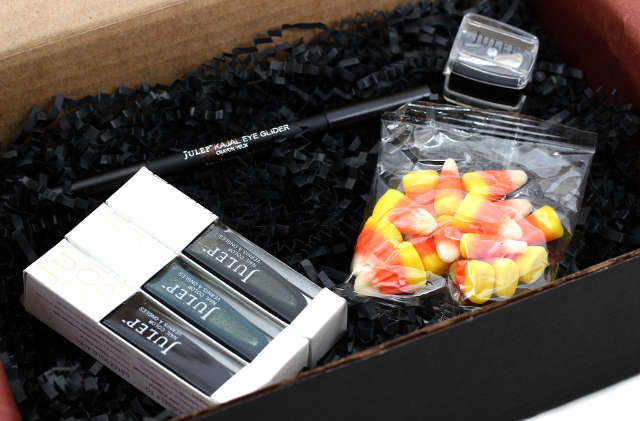 Until then, these Julep goodies that I received in my October box will help ease the waiting period. This month I decided to go with the bombshell box. 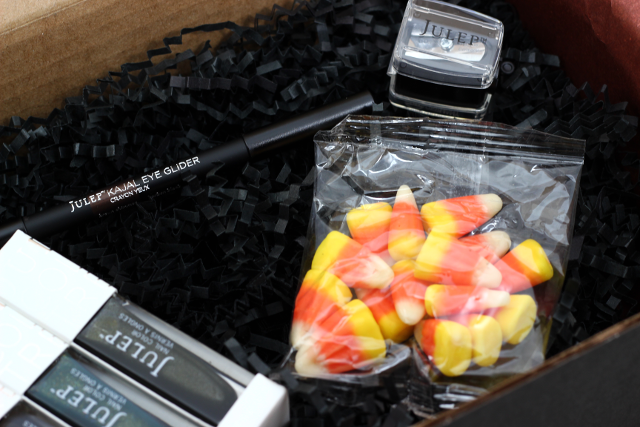 My Julep October box contained two nail colors-Cleopatra and Valerie, a double ended eyeliner pencil with an included sharpener, and a packet of candy corn which I thought was a nice touch. I also decided to add on an extra nail color-Kendra. Cleopatra: Cleopatra is not just your ordinary creamy black nail color. It has a latex/leather-like finish that looks glam and very sophisticated. It's rather lovely, and I don't have anything like it in my collection. If you prefer a glossy finish you can top Cleopatra off with a top coat, but I think doing so will take away the magical effect it gives off. Two coats provided perfectly opaque coverage. Valerie: This green teal is just all kinds of beautiful. It contains gold micro-shimmers that add a glistening touch. 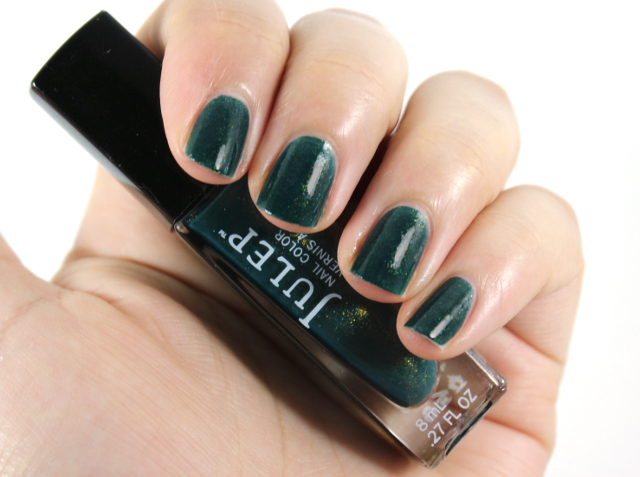 This shade is not just great for the fall months, but the winter ones as well. Valerie is super pigmented, and only needed two coats for full on coverage. Kendra: I typically don't go for shades like this one but when I first saw Kendra, I just had to add it onto my box. 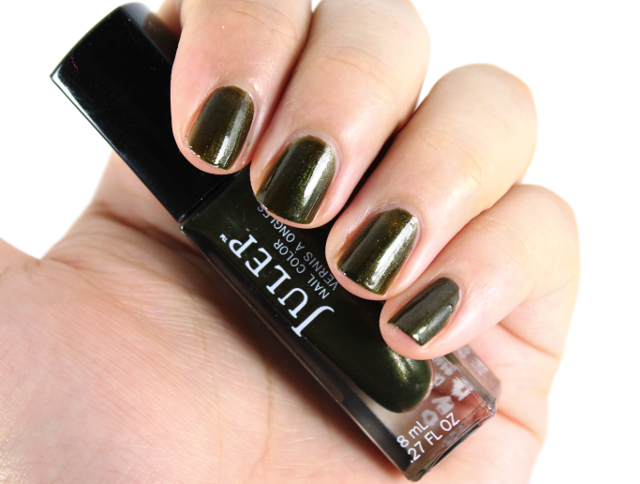 I thought this murky, shimmered olive green would make a nice addition to my fall nail color collection. I love the creamy formula of this. Two coats is all you need for super saturated coverage. 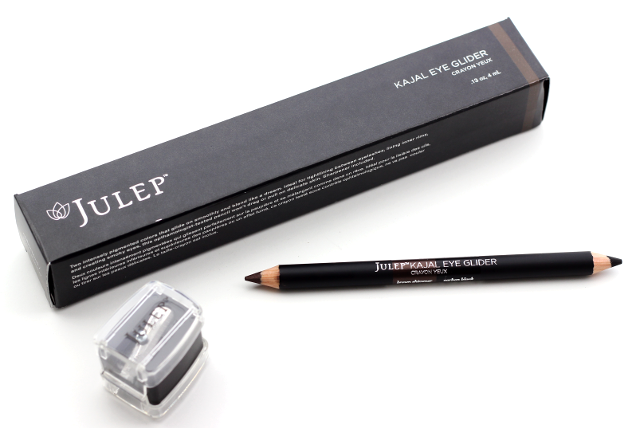 Kajal Eye Glider in Carbon Black/Brown Shimmer: I am really excited about trying out this eyeliner. I love that it's double ended and contains an included sharpener. When I swatched these on my arm, they were nicely pigmented and they felt super creamy. I love black eyeliners as much as the next, but it's pretty nice to have a brown shade for those times when you just want a subtle definition and not the dramatic effect that a black eyeliner imparts. The brown shade does have slight shimmers, but they are very faint and not overwhelming in the slightest. This eyeliner is paraben and sulfate free. To be honest, I didn't think I would be super excited about this month's box. But it's actually one of my favorite Julep boxes to date! I am pleased with every single item, and I can't wait to start rocking the nail colors-especially Cleopatra. Disclaimer: I purchased a monthly Julep subscription. This post contains referral links. For more information, please visit my disclosure page. 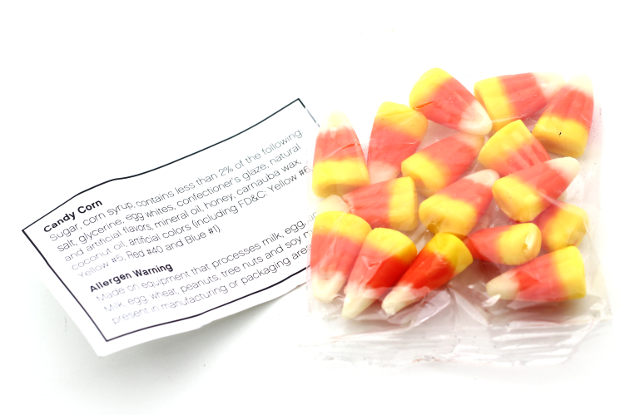 I love that they included candy corn, haha! I had to look twice to notice the gold/yellow shimmer in Valerie. So pretty and I love that they're not the standard Fall shades you hear about! Also, I'm with you on the weather here in NYC. I was ready for Fall in September and I just want to break out my boots, too!! How exciting! 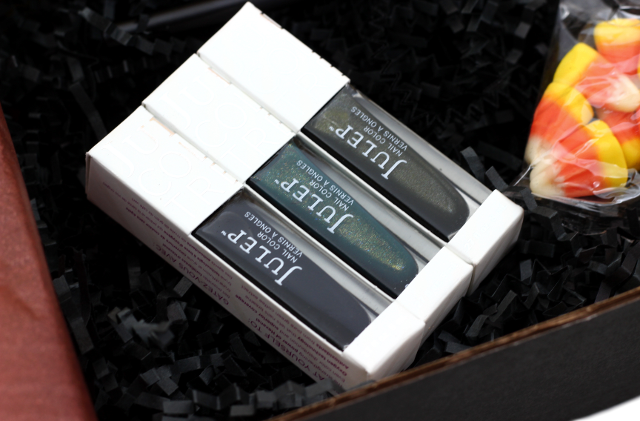 I received the It Girl box and I am so in love with the shades!